I went to the library for no particular reason and a few moments later I found myself at the crafting section. Most of the knitting books were pretty old and didn't really have anything that interested me, but these books are different and I just had to borrow them and take them with me home. 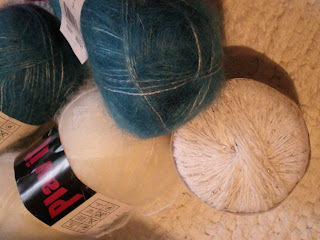 My aboslute favourites are Haiku Knits and Neulekirja. 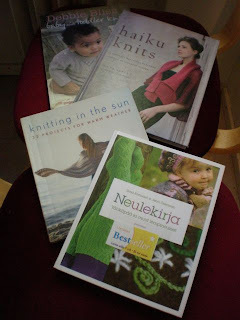 Haiku Knits has beautiful japanese-inspired knits and Neulekirja is a quite new finnish book with lovely, happy and slightly different patterns. 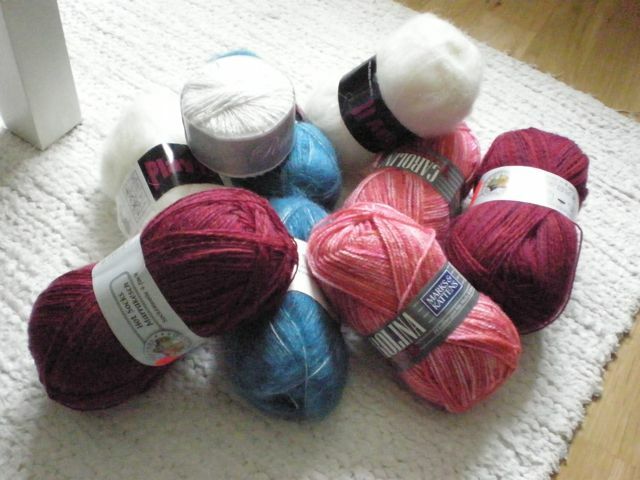 I immediately had to start knitting on a pair of socks. I hope I'll be able to show them here soon. Looks so soft and lovely, doesn't it? Oh, I can't wait to see how they turn out in real, finished projects :) The yarn with the beads I actually got for free, so I don't yet what I'll use it for, but I'm sure it'll find its' place. Now I have to study some more again, but I promise to catch up soon!